Yeti, Odlin, Sampson and Apollo are the world's most unique ones… they are big cats ~ their birth and their colour makes them most unique !!! ~ they are no ordinary animals … they are ‘ligers’ – a hybrid cross between a male lion (Panthera leo) and a tigress (Panthera tigris). Thus, it has parents with the samegenus but of different species. Away in animal kingdom, these cubs may look very similar to cats – they are not and they are too special. In biology and genetics, the term hybrid has several meanings, all referring to the offspring of sexual reproduction. In general usage, hybrid is synonymous with heterozygous: any offspring resulting from the mating of two genetically distinct individuals. This does not occur generally but is not known to be extremely rare too…. We know Lions, Tigers, Cheetahs, Leopards, Panthers and more…. heard of Tigon, Ligers and the like ?? ….. Tigon is a sterile hybrid cross between a male tiger (Panthera tigris) and a lioness (Panthera leo). The liger is a hybrid cross between a male lion (Panthera leo) and a tigress (Panthera tigris). Liger is reported to be much bigger than its parents, largest of all known felines; enjoy swimming ~ a trait of Tigers and are sociable like lions. Ligers exist only in captivity because the habitats of the parental species do not overlap in the wild. These four brothers - Yeti, Odlin, Sampson and Apollo are special as ligers and more special for they are World's first white ligers~ these rarest of the big cats of the planets are only six weeks old; weigh 15lbs and gain a pound a day. The behavior and habitats of lions and tigers make interbreeding unlikely. It is stated that in the Thirties in South Africa, the two species were put in the same cage and, to the keepers surprise, they didn't fight. In fact, they made love, and the liger was born. So popular did they become that zoos in Europe clamored for specimens. The tigress often requires a C-section performed when giving birth to a liger, because the cub is bigger than a tiger. In the 2004 movie, Napoleon Dynamite, the liger was Napoleon’s favorite animal. The four handsome male ‘liger’ cubs are the first ever to be born from a white male lion and white female tiger, making them the world’s most unique big cats. There are only around 300 white lions and 1,200 white tigers left in the world, so the cubs’ father, Ivory and mother, Saraswati, are extremely rare in their own right. 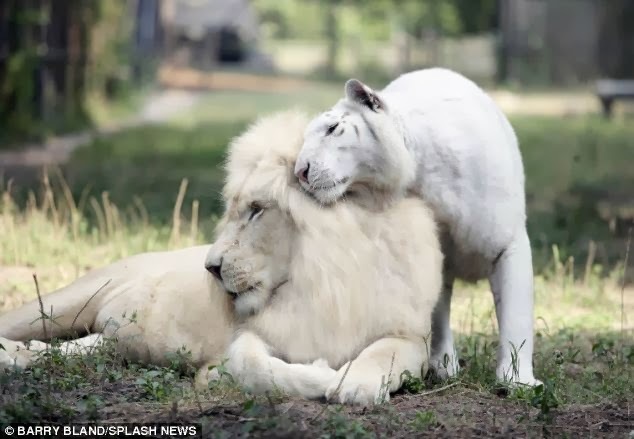 Their parents having been brought together at Myrtle Beach Safari in South Carolina have produced the first ever white lion-tiger hybrids - commonly known as ligers. The off-springs are unique because thought there are around 1,000 ligers in the world – most in captivity – but none of them are white. Apollo is the smallest, who his owners say behaves more like a house kitten, purring all the time and always demanding to be stroked. Yeti is the biggest and most boisterous, pushing past his smaller brothers and always wanting to be the centre of attention. The cubs’ uncle, Hercules, is officially the world’s largest cat at 922 lbs and 131 inches long and is featured in the Guinness Book of World Records. Founder and director of the safari, Dr Bhagavan Antle, who bred the animals, says he is sure Yeti will reach this size – if not larger. Dr Antle, who set up the safari 31 years ago and had his first litter of ligers in 1988, said: ‘People are getting on planes to fly in to see them. Ligers, white ones at that may attract crowds ~ critics say that white is only a mutation caused by severe in-breeding, thus giving rise to host to health problems …….